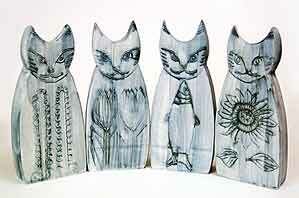 Four Carn cats - 8¾" (222 mm) high, 1¾" (44 mm) deep. John calls these 'flat cats'. They are considerably taller than his other cat, and much flatter. They have a slight forward curve, but are not as shaped as the other.